today I took three boys to see the bee movie. we went to the oceanwalk theatre and for $4.50 each- now thats is a deal! we saw the movie and bought kids packs – popcorn, slushi and skittles. 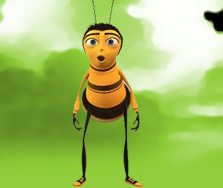 the bee movie is a great movie for kids…not very realistic interms of what bees do, but ya know what cartoon is that has jerry seinfeld as the voice of the main character. I asked the boys what their favorite part was and hands down it was when the bee was stuck to a tennis ball and wacked around the court. we took colin with us and had a great day at the movies! family time is so precious when you spend so much time at work. that afternoon we did an outreach to stewart marchaman- 4 homes! later that night i went to the common room to watch josh barker release his new cd…overall saturday was busy but fun! This entry was posted in youth ministry and tagged bee movie, josh barker, popcorn, theatre by altheforce. Bookmark the permalink.